Sometimes the best thing we can do to help an amulet is simply to give it some better packaging or more support. All the materials we use for packaging are inert and stable. This means that the packaging materials themselves aren’t going to deteriorate or give off harmful gases and they don't have any chemical residues. 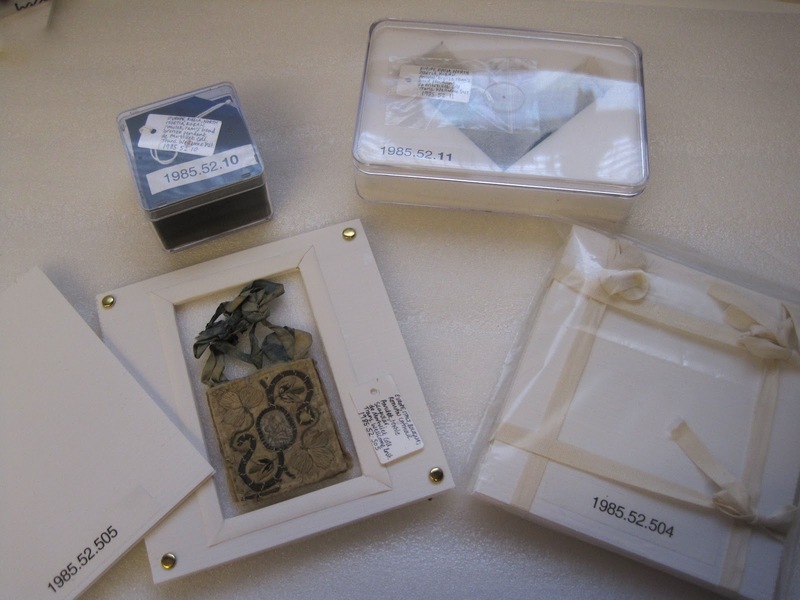 Any gases etc., which a packing material might give off, could increase the deterioration of the artefacts they are trying to protect. The plastic boxes we use for storage are made of Polypropylene or Polystyrene, which are very stable plastics. Both are easily available on the high street. We tend to use materials such as Plastazote, Jiffy foam (both Polyethylene foams) and acid free tissue to cushion around objects. Correx board (corrugated Polypropylene sheeting) or acid free mount board is used to support them. 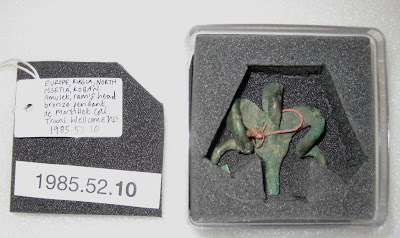 In the image below, amulet 1985.52.10 (a bronze ram’s head pendant from Russia) has been cushioned using black and Plastazote and then placed in a crystal (Polystyrene) box. Amulet numbers 1985.52.504 and 1985.52.505 (both textile scapulars from Italy) needed more support, so they were placed on a Jiffy foam lined piece of Correx board with a window cut in it and then another Correx board on top.